When I ordered this suit I was very excited to get it, and when it came I was even more excited to have it. 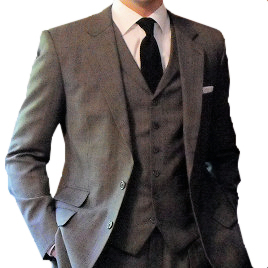 The suit is *beautifully* made, with top notch stitching and made with blatantly obvious first class craftsmanship. The color (dark grey) is fantastic, and the fit is perfect! The most amazing part about this suit was the fast shipping! It left Thailand Tuesday at midnight and arrived here in California Thursday at noon, just in time for my sister's confirmation Mass tomorrow! How amazing is that? Thanks Magnoli, for a fantastic suit and good communication! You're the best!